Newsroom drama detailing the 2004 CBS 60 Minutes report investigating then-President George W. Bush’s military service, and the subsequent firestorm of criticism that cost anchor Dan Rather and producer Mary Mapes their careers. ‘Truth’ has perhaps been a little unfortunate to come out so soon after the Award winning ‘Spotlight’ which it shares similarities with whilst not being of the same quality. 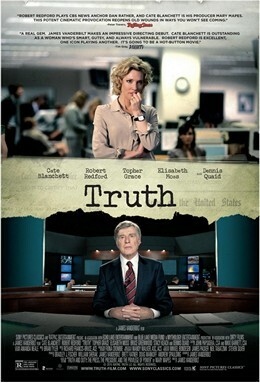 ‘Truth’ focuses on an investigation by CBS’s ’60 Minutes’ TV programme into George W. Bush’s military record around the time period when he was fighting re-election against John Kerry. The military records of the two men had become a key factor in the debate (which says a lot about the focus of politics in general), with Kerry in particular being smeared. When the ’60 Minutes’ team, headed up by Mary Mapes (Cate Blanchett) discover discrepancies in Bush’s past, they ran an exclusive on their show which very quickly backfired as it became apparent that there were issues with the evidence they had gathered. The script views the investigation and the subsequent fallout through Mapes eyes, and Blanchett is mostly good after a poor opening scene. We learn that she is a dedicated investigator with a lot of experience and we meet the rest of the team she is assembled, who are solid if unspectacular and mostly given little to do beyond service Blanchett’s character. As CBS anchor Dan Rather, Robert Redford is the only other performer given much to work with and he brings a suitable gravitas to the part to compliment Blanchett. The film is directed by ‘Zodiac’ writer James Vanderbilt in his screenwriting debut, and he has constructed a sharp script that gets into the detail of the situation, with the film’s strongest moments digging into the ethical dilemmas in journalism and the importance of fact checking. ‘Truth’ makes it abundantly clear that Mapes and the rest of her team didn’t complete the necessary due diligence but it does raise interesting questions about when the truth isn’t the truth. There are a couple of great scenes towards the end of the film, one from Redford where he laments the dumbing down of news and journalism in general, and one from Blanchett where she rallies against the assumption that their story on Bush and the evidence collated was fake. Ultimately though, journalistic privilege is important and it doesn’t give journalists and investigators the right to run stories if they can’t fully back up their claims. This is an important point that ‘Truth’ sometimes struggles with as it comes from Mapes point of view with limited opposing viewpoints. Where Vanderbilt particularly falters is in his direction which is overly cinematic with a melodramatic score and a reliance on painful cinematic tropes such as montages of people reacting to news stories in bars/cafes etc (yeah we get this was an important development in the campaign but by and large people don’t stop what they’re doing to watch political news). This is perhaps where the differences with ‘Spotlight’ become more apparent, and whilst every film should be judged on its own merits it’s hard to brush aside when both films came out in a similar timeframe, both targeting the same awards conversations. ‘Spotlight’ succeeded for many reasons, but largely for me due to its understated direction and trust in story and performance to deliver on its themes. ‘Truth’ doesn’t have that confidence and it engineers too many awards reel moments and feels like it has to emphasise the importance of its story and the work its characters do, as opposed to trusting the audience to understand that themselves. ‘Truth’ is an engaging and intelligent adult drama, and I enjoyed it a lot even whilst finding many faults in its approach to the material.